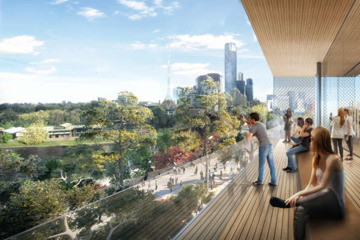 Revealed by the Federation Square website, the new design does away with the sloped roof sections, and instead adopts a squarer appearance that is said to complement the square's existing buildings. As well as providing balconies on the upper floor, the store also uses a new roof design that can be used with solar panels, and a new solar shading design claimed to enhance the energy efficiency of the building. 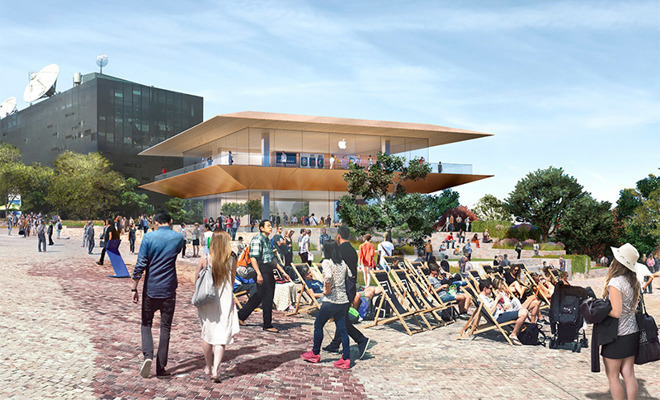 The architectural changes were introduced following a series of design workshops involving Federation Square Management, the Victorian Government, Melbourne City Council, and Apple itself. The refined store is part of a broader reimagining of the location, which includes a digital facade on the Transport Building and a new Melbourne Metro Train Station entrance. The new store is expected to create more than 500 square meters (5,381 square feet) of new public space, and along with enabling more cultural events to be held, it is expected to attract two million more visitors to the square annually. 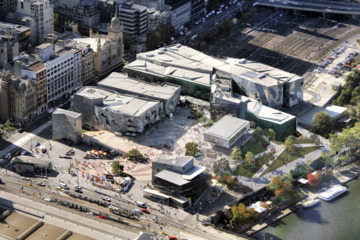 Federation Square CEO Jonathan Tribe said the store is "consistent with Federation Square's Civic and Cultural Charter, which recognizes Melbourne's pre-eminence as a center for creativity and innovation." 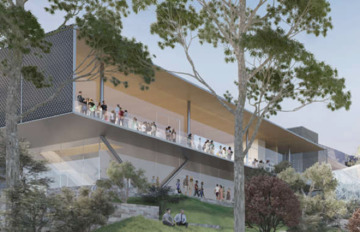 Apple's original vision for the store was revealed in December 2017, with the intention of commencing construction in 2019 and completion in 2020. More than 200 Apple retail employees would work at the store, with some dedicated Creative Pros tasked with leading "Today at Apple" sessions at the outlet. Critics disliked the first proposal, calling it a "Pizza Hut pagoda" and lobbying for a redesign. By February, the city council had received more than 800 submissions rejecting the design, while council members were unanimous in a motion to lobby the government for a redesign. It is unclear if the second attempt will be accepted or receive more complaints from the public. It is also unknown if the existing construction schedule will continue as planned or will face delays.